A night in with a curry can be just what you need after a long day. But, what you don’t need is a stubborn curry stain on your carpet. Let Rug Doctor help clear it up, so you can continue enjoying your meal. Our Oxy Power Stain Remover is a multi-surface cleaner that will come to your aid, no matter where the spill happens. Its unique oxy formula will make light work of removing colourful curry from your carpet, even making turmeric stains invisible! Want to finish your takeaway before cleaning up? No problem! Rug Doctor will be waiting to work its magic. Enjoy a reliable and powerful clean that gets rid of even dried-in stains. 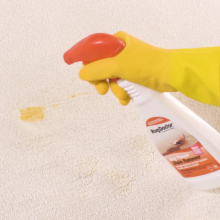 Try this Rug Doctor product in any room of your home; it also works on surfaces like tiles, plastic and painted walls. It’s even safe to use around your pets, giving you peace of mind. Shake the bottle well and turn the nozzle to the ON position. Put on household gloves for protection. 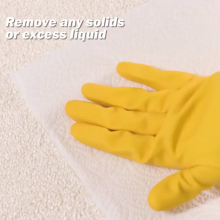 Remove solids or excess liquid with a paper towel. The cleaner and more absorbent, the better! Spray Oxy Power Stain Remover onto the area without over-wetting, and let it work for 3-5 minutes. Blot the stain away gently with a damp, colour safe sponge or cloth. Press firmly into the stain and move from the edge towards the centre. Allow the carpet to dry and try another application if the stain is particularly heavy. Then, turn the nozzle to the OFF position and store the bottle upright. 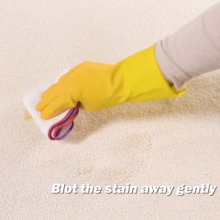 When you’ve mopped up your curry stain, try using a Rug Doctor machine to transform the rest of your carpets. Curry stains can be difficult to tackle, but we’ve got the tools to make your clean-ups stress-free. Rely on Rug Doctor to deal with the mess so you can spend more time with your loved ones.